Camera straps are uncomfortable, easily get in the way, and they just aren’t all that secure. I mean, having your expensive camera dangling from your shoulder with little to keep it from sliding off and falling to the ground just isn’t a good idea! 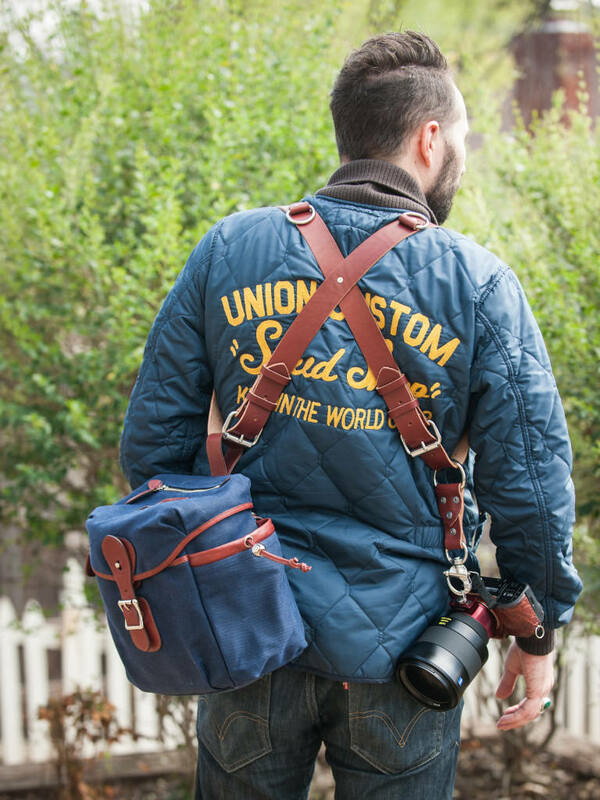 Yet a lot of photographers still persist in using the low-grade shoulder strap that came with their camera. Maybe it’s an issue of economics - you just bought a camera and don’t feel like you can afford a better way to secure your camera to your body. It might be an issue of just not being educated about the other options that are available too. I’ll just come right out and say it - I’m a big fan of camera harnesses. With that in mind, let’s review a few reasons why a camera harness is a better idea than a camera strap. As noted above, a single camera strap, particularly the flimsy one that comes packaged with camera bodies, just doesn’t offer you that much in terms of security. First, with a single camera strap, your camera is free to bang around at your side while you walk. Just the motion of your body’s movements is enough to slide the strap down your shoulder, perilously close to simply falling off. Second, a single camera strap can be easily cut by thieves. One minute you’re happily walking along with your DSLR on your shoulder, and the next thing you know, someone cuts the strap and takes off with your gear. That’s doesn’t offer much peace of mind. But, a camera harness like the one pictured above solves both of these security issues, whether you’re an enthusiast photographer or you’re constantly on the go from one shoot to the next. By using criss-cross straps, your harness not only makes it difficult (if not impossible) for would-be thieves to abscond with your camera, it also creates a more secure system for wearing your gear. With both shoulders involved in keeping the harness in place, you needn’t worry about your camera sliding off your shoulder. 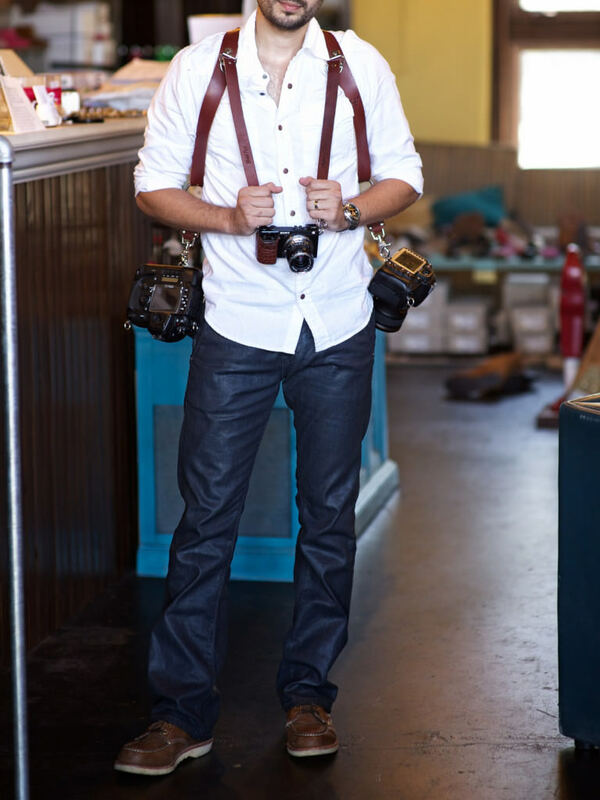 What’s more, with anchored metal d-rings and safety straps like those found on the Holdfast MoneyMaker, you can rest assured that your camera(s) will hang by your side without the possibility of becoming detached from the harness. Anyone that’s ever carried a camera around using a single shoulder strap knows how quickly they cause your neck and shoulder to hurt. It makes sense, too - the thin strap puts all the weight of the camera on a small space on your shoulder. Naturally, the way to more comfortably carry your camera would involve a system that spreads out the weight of your gear more evenly. 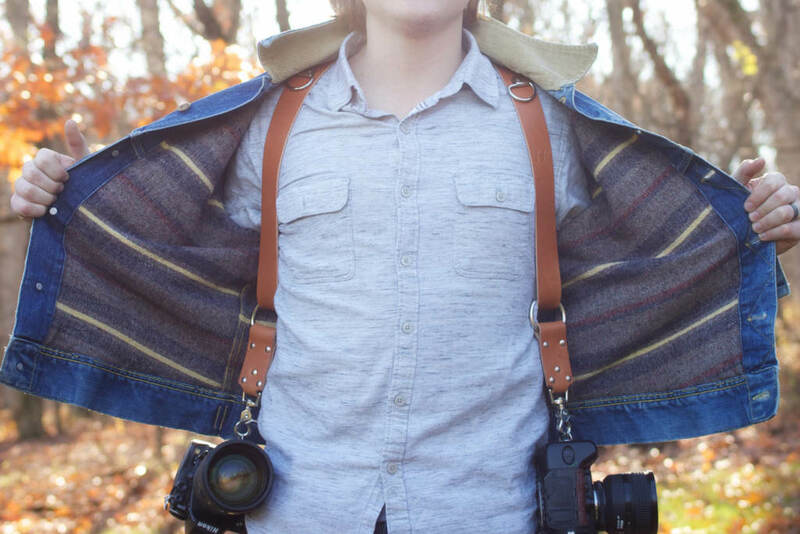 A camera harness like the one pictured above does just that. With the weight of your gear evenly distributed across your shoulders and back, you can more comfortably carry one, two, or even three cameras, or some combination thereof with a small camera bag. All that on one harness! 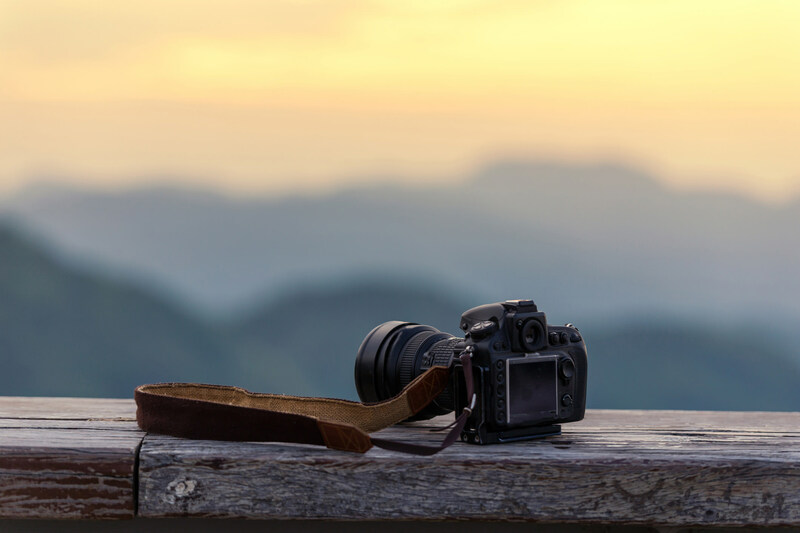 Better still, you can get camera harnesses that are made of soft, form-fitting materials like full grain leather for an even more comfortable fit. In that regard, a good camera harness is like a good lens - you get what you pay for. And though a good harness might be pricey, your body’s comfort is worth it, is it not?! You’re out shooting with your camera on a single camera strap and find that you’re constantly having to adjust it on your shoulder, even holding your camera as you walk because it’s so inconveniently placed at your side. We’ve all been there, but there is a solution. You guessed it - a camera harness! Just look at how the cameras of the photographer above hang perfectly where they can be easily accessed. 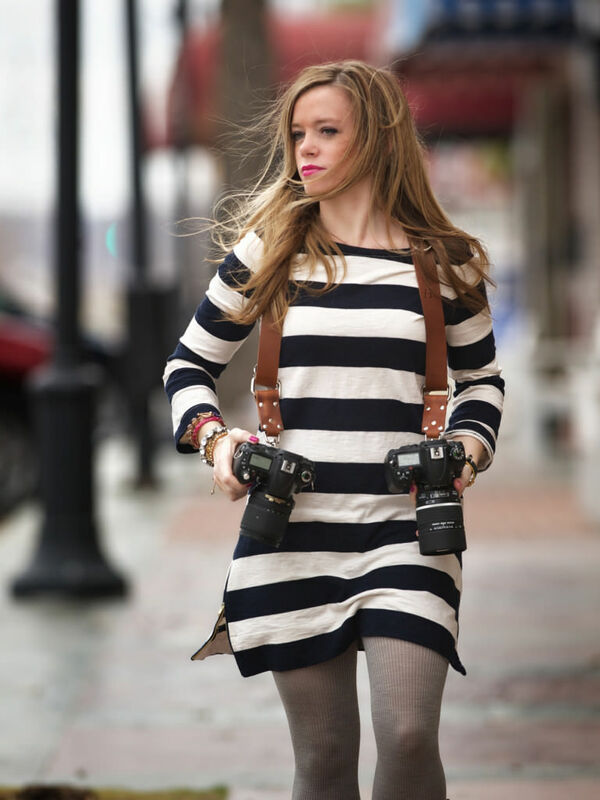 Note how the cameras are right at the photographer’s fingertips when she draws her arm forward. Note as well how both cameras hand high enough that they aren’t in the way - no more banging them around on anything as you walk by. Systems like the Holdfast MoneyMaker give you all these benefits and more. In fact, with the addition of a camera leash, you can even add a third camera to the harness as shown above. 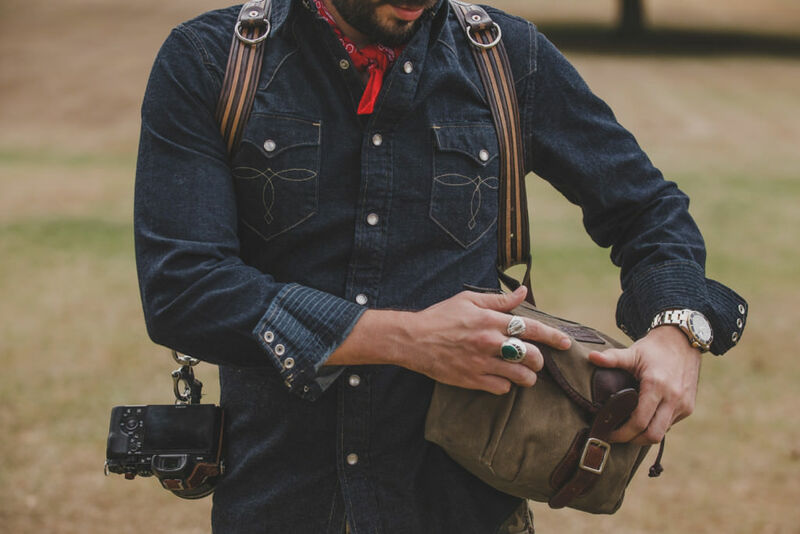 As mentioned earlier, you can also attach a small camera bag, as well as any number of pouches that can hold personal items like your smartphone. Now that’s ease of use! No more stopping what you’re doing to swap out camera bodies or lenses. Have two or three bodies with different lenses ready to go, right at your fingertips. What’s more, with a camera harness, you don’t even have to kneel down to get something out of your camera bag because you can have it right there on you as well. 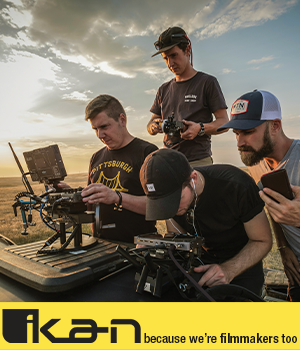 That means if you want to shoot with greater ease, in greater comfort, and with improved security, a camera harness like the Holdfast MoneyMaker should be at the top of your must-have list.